After 136 years of mystery and speculation, the circumstances surrounding the famous 1864 disappearance of the Confederate submersible, the H.L. Hunley, may soon be determined by researchers. The 40-foot wreck of the "South's Secret Weapon" was discovered buried in up to four feet of sand and shells off the coast of Sullivan's Island, South Carolina, in May of 1995, after a 14-year search by a team funded by author Clive Cussler. After five years of investigation, measurement, and documentation, professionals from the Naval Historical Center's Underwater Archaeology Branch, the National Park Service, the South Carolina Institute of Archaeology and Anthropology, and other organizations combined efforts to raise the Hunley and transport her to shore for study. 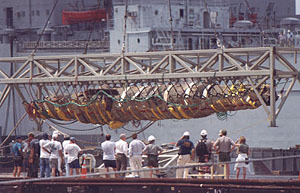 In August 2000, slings were slipped under the hull of the sub, which was supported by foam pillows, and attached to a truss; the entire wreck was then lifted by crane onto a transport barge. Built by some of the best engineers of their time, the thin, cigar-shaped H.L. 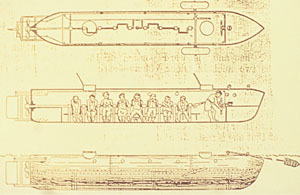 Hunley, named for her second captain who died with his crew during sea trials, was manned by a crew of nine: eight to turn the hand-cranked propeller and one to steer the vessel. Left, sketch and deck plan of the Hunley by Simon Lake from a description of the vessel by crewmember Charles Hasker. Published in McLures Magazine in January 1899 and available at the National Archives. Researched by Mark K. Ragan. 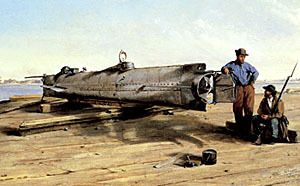 In August 1863, the Hunley was dispatched from Alabama to serve in defense of Charleston. During the night of February 17, 1864, the sub set out on her maiden attack--her target, the U.S.S. Housatonic, a 1,240-ton Union sloop-of-war. The Hunley rammed the wooden hull of the Housatonic with her harpoon torpedo, packed with explosive powder and mounted on a long iron pole extending from her bow; the charge was detonated at a distance by pulling a rope as the sub backed away. The Union ship sank in three minutes, taking five crewmen with her. Reports from Housatonic survivors confirmed the success of the attack strategy. After realizing that the submersible was not a porpoise or harmless debris, as was first assumed, the alarm was raised and officers on deck fired their rifles at the sub. The officers' last sighting of the Hunley was as she reversed her course and headed for shore. She never arrived. In 1995 archaeologists found the Hunley almost intact except for a hole in the forward hatch. 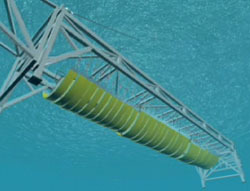 It is believed that the sub quickly became covered and filled with sediment soon after she sank. Items expected to be preserved inside the hull include navigational gear, steering mechanisms, pumps, a compass, a depth gauge, various tools, and firearms. Remains of the crew and their personal effects are also hoped to be recovered. If indeed found, these remains may help to determine the final moments of the ship, as well as the identity of the crew and the precise cause of their deaths. Following analysis, the crew will be buried with military honors. The Hunley is now in the Warren Lasch Conservation Center. 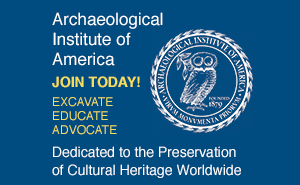 The conservation process is expected to last approximately seven to ten years. Project directors are currently redesigning their plan for opening and entering the Hunley's hull now that they know exactly what state the vessel is in. Although the Hunley was not the world's first submersible, she was the first to engage and sink an enemy warship. Her successful attack, not repeated until World War I, proved the great potential of submarine warfare. For additional information on the history and current situation of the Hunley, visit the Friends of the Hunley's official website: www.hunley.org. 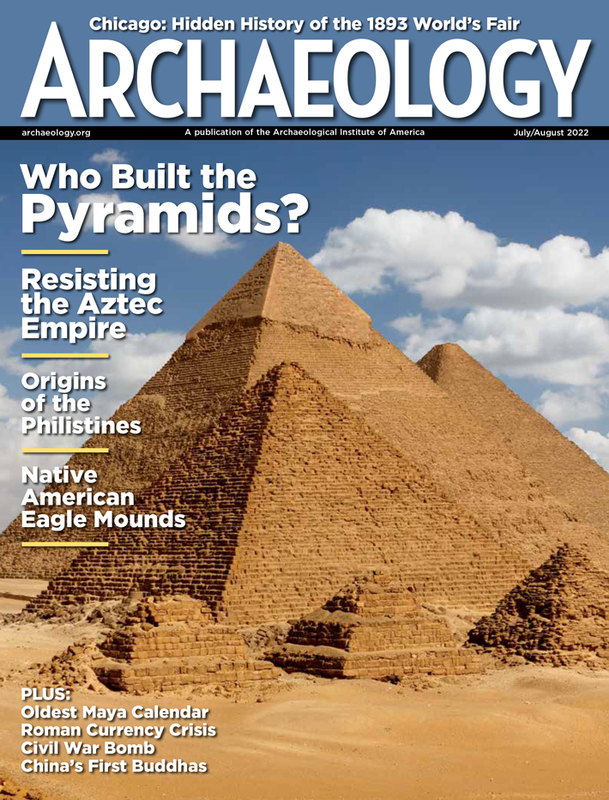 Carolyn Swan is a student at Dartmouth College and an intern with ARCHAEOLOGY.